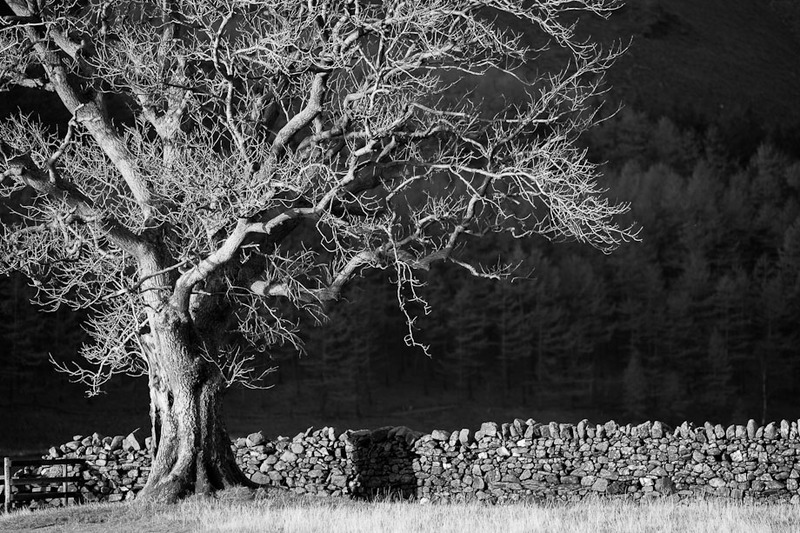 Black & White image of old tree from The Lake District. Yes another tree and another image from the lake district. On a walk around the Buttermere lake on the rather dull and windy day the sun just broke through the dark skies and illuminated the old tree near the lake. I was busy looking a birds on the lake and just turned around… and tried to focus on the new subject. I personally like how the tree stands out with big contrasts against the dark background, the stone wall and the fence to the left. The image was captured with the Canon 5D Mark II and the Canon 70-200m f/2.8 zoom lens. Very atypical the image were shot handheld but given all the light the Black & White image is still tack sharp!